State Selection Board, Odisha (SSB Odisha) is in process of taking exam for Lecturers on 13 & 15 April 2016. Earlier State Selection Board, Odisha released notification for 1625 posts of Lecturer in Non-govt Aided colleges of Odisha. Now Admit card of SSB Odisha Lecturer had been released on 31 March 2016. 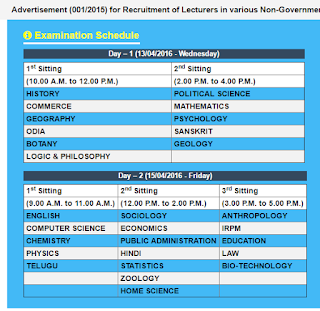 Through this page, you would get SSB Odisha Lecturer Exam Admit card from below. Admit Card is now available for download. Login and download the Admit Card. Contact helpdeskssb(at)gmail(dot)com if you find any issue in downloading. There shall be a written Examination only in the concerned subject as per the syllabus given in the website. The Examination in the concerned subject will be of one paper carrying of 100 marks. The questions will be of Objective Type (Multiple Choice) which are to be answered in OMR sheets. 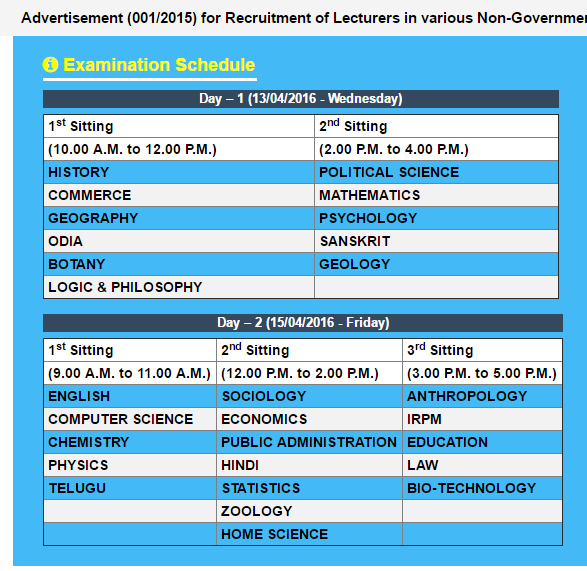 Odisha State Selection Board is going to conduct written exam on 13.04.2016 and 15.04.2016 in 3 sittings for 1625 Lecturer posts. Those who got appointed, will be given Rs.9,300/- to Rs.34,800/- carrying a Grade Pay of Rs.4,600/-(PB-II). The posts are temporary but likely to be made permanent. The candidates shall be called for interview by the State Selection Board in order of merit on the basis of total marks secured by the candidates both in the Career and in the Written Test. In general, three times of the number of vacancies in any subject shall be called for the Viva – voce. But, if the vacancies are up to 05, fifteen candidates shall be called for the same by the State Selection Board. The written examination will be held at Balasore, Berhampur, Bhubaneswar, Cuttack and Sambalpur centres depending upon the number of candidates from the respective Zone. The eligible candidate will be required to download their Admission Card from the Website for Written Examination. No separate Admission Card will be sent to the candidates.